It's already August, if you can believe it, and we are almost half way through second-quarter earnings season. What a year it's been already. But for those that may have missed the historic run that the markets have been on since Donald Trump's election, TheStreet is out with a fresh batch of stocks and strategies to help you navigate the rest of the year. While standbys Walt Disney Co. (DIS - Get Report) and Nvidia Corp. (NVDA - Get Report) remain at the top of the list, there are some companies, such as SiriusXM (SIRI - Get Report) , that may surprise you. On a such a busy day for earnings, it's hard to avoid the subject, though it is indeed at the top of many people's minds. Of course, all eyes were on Apple Inc. (AAPL - Get Report) on Tuesday, as the Cupertino, Calif., company reported earnings after the closing bell. The company delivered on the back of strong iPad and Macbook sales. But we will have more on that tomorrow; today I'd like to focus on Pfizer plc (PFE - Get Report) , at least in this newsletter. The pharma giant was in the spotlight Tuesday as the company reported a top-line miss, despite beating on its bottom line. Part of the blame, according to those on Wall Street, goes to declines in legacy businesses like Viagra and Lyrica, which are set to go off patent. But while the company does have a strong pipeline, the miss has rekindled thoughts of a Pfizer tie-up with Allergan plc (AGN - Get Report) . Allergan and Pfizer saw a $160 billion deal squashed by Obama Administration regulators in 2016, but things could be changing, both politically and financially for both companies. Remember those pesky activists i've been droning on and on and on about for, well, ever? Well, today, the group got a boost as S&P Dow Jones Indices LLC, the company behind the S&P 500 Index, moved Tuesdayto exclude businesses that issue multiple classes of shares giving insiders control of votes from participating in the firm's indices. The move excludes Snap Inc. (SNAP - Get Report) and Blue Apron Holdings Inc. (APRN - Get Report) from being index-eligible and will also deter companies seeking to raise money but give little to no voting power to shareholders from going public. If Uber Technologies wasn't already rethinking its path to the public markets, I bet they are really pondering how to approach the move now. Talk about pesky. A group of newspaper companies, including Cox Media Group Inc., McClatchy Co. (MNI - Get Report) and Tronc Inc. (TRNC , have teamed up to press LexisNexus to pay more to use their content within their database. Our media columnist Ken Doctor has obtained the confidential letter from the ink-stained fogies. Speaking of confidential information, TheStreet's finance editor James Langford managed to get a hold of an internal memo at General Electric Co. (GE - Get Report) sent around by its newly appointed CEO John Flannery. The successor to Jeffrey Immelt, Flannery lays out his vision for GE and his plan for the future. TheStreet also had a chance to sit down with Intel Corp. (INTC - Get Report) CEO Brian Krzanich to discuss the future of autonomous driving, competition for Advanced Micro Devices Inc. (AMD - Get Report) and Qualcomm Inc. (QCOM - Get Report) , and the tech rally, among other things. Marine theme park operator SeaWorld Entertainment (SEAS) has reportedly hired investment bank Evercore as a second adviser to work with its other financial adviser JPMorgan to devise a business plan to appease activist investors pushing for change. Investor group Hill Path Capital LP, founded in 2014 by former Apollo Group and Goldman Sachs & Co. (GS) banker Scott Ross and others, has raised its SeaWorld stake to 13.3% and initiated talks with the company. SeaWorld opened its gates for the first time in 1964 in Mission Bay in San Diego. 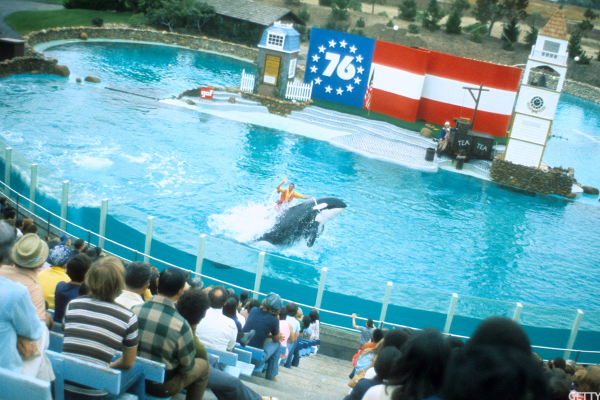 Above is a photo from SeaWorld Orlando in 1976 during its bicentennial celebration.